Risk and Reward is the name of the game for any market. 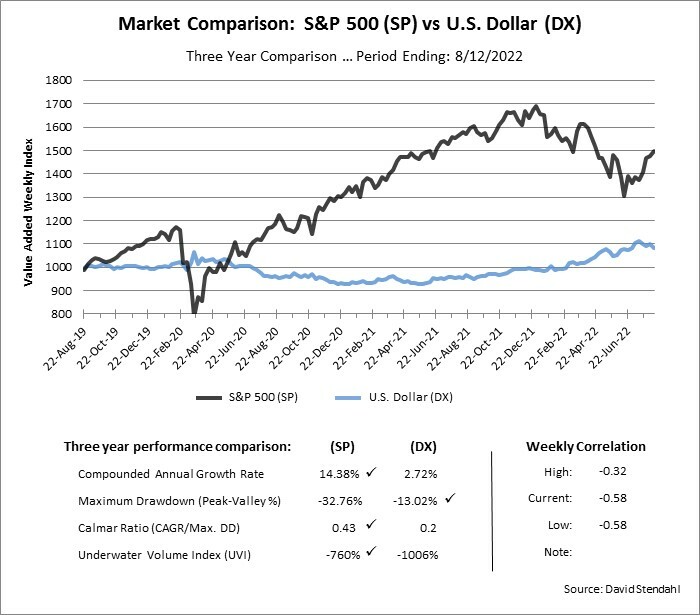 The chart below compares the S&P 500 Index against the Dollar Index over the course of three years. The comparison has been normalized using the Value Added Weekly Index (VAWI) method. The VAWI line assumes an initial $1,000 is invested in each market. Over time, weekly percent returns are added and subtracted to show individual performance equity curve for the markets. It should be noted that in the futures markets, we can’t invest exact amounts because we cannot trade fractional contract, so the VAWI line provides direction but not actual price levels for the market. The VAWI method does however provide an advantage as it normalizes performance which allows us to evaluate futures markets on the same scale. Reward: Compounded Annual Growth Rate (CAGR). Reward/Risk Ratio: Calmar is a 36 Month CAGR / Max Drawdown ratio. Total Risk: Underwater Volume Index (UVI) summarizes all Drawdown periods. Market Correlation: High, Low & Current correlation values. Check marks indicate the best performance over the three year test period. Take a look at our rolling monthly correlation for the Dollar Index. Only risk capital should be used when trading futures. Investors could lose more than their initial investment. Past results are not necessarily indicative of future results. The risk of loss in trading futures can be substantial, carefully consider the inherent risks of such an investment in light of your financial condition. Maybe we should call this Great Friday ... cause I'm getting a ton of projects done.